Mermaid's Hideaway: Come and getaway where the ever-elusive Mermaids love to stay. RENTAL SIGNIFICANTLY CHANGED APRIL 2018: Full House now for rent (includes downstairs unit), minimum stay length increased. Casual cottage/beach bungalow style with Hawaiian and oceanic decorative touches throughout. Sitting well above the rest, this home offers panoramic views from nearly every room. Relax on the expansive 700 sq ft deck as the tradewinds roll off of the ocean to keep you cool outside. World famous Lanikai Beach is about a 300 meter/5 minute walk, just over a city block away with easy public access. Come hideaway in a quiet & cozy neighborhood that boasts jogging, biking, hiking and fun in the sun....private feeling, conveniently close to the beach, but just a bit set back to give quiet and privacy on days when it is busier on the beachfront. Caretaker lives nearby for responsive service. Neighborhood is quiet and residential, so a premium is placed on mellow, respectful and neighborly guests. House has a main entry-level floor with two bedrooms, kitchen and bathroom and laundry room. The uppermost level has the Master Bedroom and full bath and also has an adjacent studio area with office/TV viewing area and pull-out couch. There is also an entry from the main level to a lower level apartment. This level hosts Bedroom #5 and #6 and two more full bathrooms. It also has a full second kitchen, dining and living/TV area, and a second laundry room. This lower level has a separate second entry from the street if the upper and lower unit groups would like a bit of separation. The lower area has an ocean view lanai that runs the length of the unit. There is off-street parking for two medium size vehicles adjacent to the main level entry. Renters of this unit are limited to two vehicles in total. On street parking in front of this unit is not permitted for renters or guests. Property not appropriate for parties, reunions, large family gatherings, receptions, wedding gatherings, etc. due to limited parking (2 spots) and noise concerns. Property not appropriate for having more than a few local guests or family visit due to parking concerns.Property has strict 10 person guest limit, generally 10 adults in 5 beds is the comfortable maximum with 1-2 youngsters on the fold out sofabed. Calendar is kept private in the interest of security and tenant privacy - please inquire about dates. Pricing is seasonal. Use web quoting for pricing. Rates subject to additional Hawaii Taxes (GET & TAT) of 14.91% (Honolulu County) and VRBO's service fee. Please use pricing tool to get an accurate sense of booking costs. Due to zoning laws, only one rental each 30 days is allowed in this exclusive neighborhood. We encourage longer term rentals. Rentals 2-3 months or longer please inquire for custom pricing. Christmas rentals require a 14 day minimum stay. The upstairs bathroom is an ensuite full bath with separate toilet area. This serves the single master bedroom on the second floor. On the first floor, a hall bath serves the 2 downstairs bedrooms and the common area. It is a shower (no tub) bathroom, but has about a 12" "curb" to step over and into the shower. The lower level suite area with full kitchen and laundry has two full bathroom. The ensuite bathroom has a tub/shower. The other off the living area has a full bath and shower. Set against the rising terrain of the coast. Famous 'Pillbox Trail' access just down the road (and transits above the house) for a great hike and awesome views. 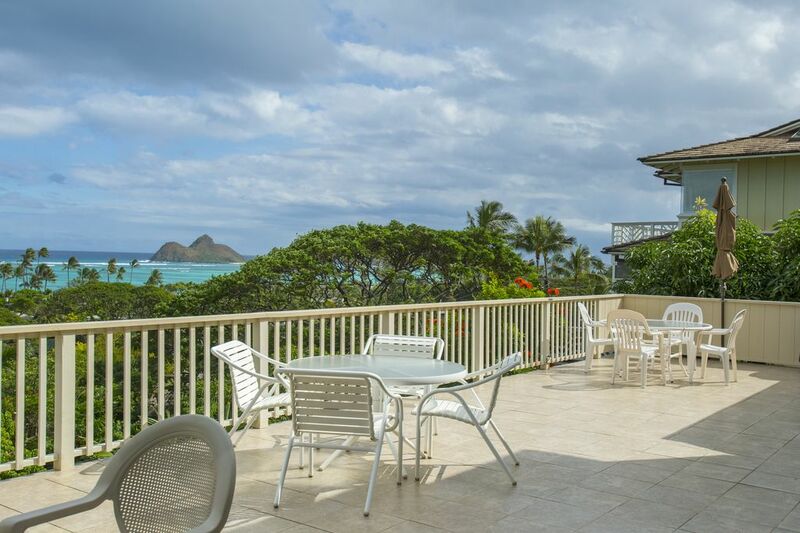 Panoramic View of ocean of Lanikai and the Mokulua Islands from both the main and lower level deck on main house and upper deck off Master Bedroom Suite and Upper Living Room. With icemaker on the main floor. A second refrigerator is located on the lower level. Electric Oven main floor and additional stove oven lower level. Basic amenities such as toilet paper, paper towels, garbage bags, are provided. Seating for 6 inside or seating for 8 outside on deck on the main floor living area, and as well seating area for 4 in the lower level kitchen/dining area and as well the lower level deck. Various books for light reading as well as guidebooks are in the home. Large garden area with walking path to the beach. Kaneohe Yacht Club nearby, offers reciprocal privileges to many Yacht Club members. Contact KYC to inquire. Same in Waikiki. Large main floor ocean view deck off the kitchen and living area. As well there is an ocean view deck of the lower level living area, which is accessible by and interior stairway from the main floor. Boogie boards are available as well as beach chairs. There are two steps down from the parking area to the front door. There is a small step up across the threshold to enter the front door. As there are 2 bedrooms and one bathroom on the first floor, it is possible for someone with impaired mobility who can navigate a few steps to get around. We have had guests use wheelchairs while here, but they have not been fully restricted to the wheelchair. Lastly, the person with impaired mobility would need to be able to step over a "curb" that is about the same height as a bathtub in order to enter the shower. There are not grab rails for assistance. One Block away from Beautiful Lanikai Beach -- all the beauty and access with the added benefit of being one block away, elevated on the hillside with stunning views, and extra quiet. The 3-story house perched on a hill , 1 block from Lanikai beach and 1 block below the Pill box trail (although the trail will be closed for the next 2 months for repair; the alternate route @ Po'o Po'o lane is harder but equally beautiful). We love the home - its location and view. Air conditioning & wifi is excellent. Terri and Kim are very gracious and helpful. We will definitely rent this home again...hopefully longer next time. Mahalo! We stayed at this well appointed home for a week. It was located close to the sights we wanted to see. and was only a 5 min walk to the beach ( if even that) . We utilized the Deck a lot because of the fabulous lanai This is where we had Coffee every morning for of the view and to watch the sun rise.There were 6 of us and the house was big enough for us all. There were beach chairs,cooler,boogie boards and many other items for us to use. Thank you Kim and Terri We will be back !! The view from the house was great as was the beach access. Thanks, Kathy - enjoyed having you and hope that you had a great trip home! We had a great time at this house for our family reunion. We truly loved the view, as everyone else has said. We also appreciated the sense of space. With 5 adults and 1 child, we felt the space was roomy while allowing for lots of casual and leisurely family interaction. The location was just superb. Its proximity to the ocean made it easy for everyone to enjoy the beach in ways that suits them without having to coordinate with the whole group. For example, it got windy and cloudy on a few days during our stay, so some of us just went for a 30-minute walk on the beach, or a 20-minute swim in the ocean, or some combination thereof, and then returned to the house to enjoy the view, when the brave ones stayed in the water for the whole afternoon. We felt we got a little bit of the beach everyday, even if we had other sightseeing activities or when the weather wasn't perfect. The house itself is clean and well-maintained. All the beds are firm and comfortable and we all slept well. It is an older house, so there are things that are not in spiffy conditions, e.g., some of the blinds aren't working well, the dining room ceiling lights are a bit finicky, etc. But if we noticed these things, they didn't bother us. Terri, the manager, was just a pleasure to work with -- super friendly, clear, organized, and accommodating. When we noticed minor things, e.g., the kitchen was out of salt and cooking oil, she addressed our concerns immediately. She also offered very useful suggestions for grocery and dining. It was a treat having you and your family visit! Glad you had a relaxing time! It was a delight getting to know you all and spend some time! Really glad our paths crossed. Farmers markets Thursday morning, Sundays in nearby Kailua proper. Horseback riding available in Waimanalo just 20 minutes away. Kayak rentals and also kite-surfing lessons available.